From inspiring millions to display random acts of kindness to people in their neighbourhood, to getting an entire nation hooked on a 30-day fitness challenge, the Crown Prince of Dubai has had a very busy 2017. As 2017 wraps up, Khaleej Times takes a close look at everything that Sheikh Hamdan bin Mohammed bin Rashid Al Maktoum, Crown Prince of Dubai and Chairman of the Executive Council of Dubai, has done for all residents of the UAE. All the initiatives launched by Sheikh Hamdan has been a true testament to Dubai's commitment to driving positive change. In April 2017, as the emirate celebrated three years of Smart Dubai's success, the Crown Prince launched the Smart Dubai 2021 initiative, saying: "The Dubai Government will issue its last paper transaction in 2021." He added, "Today, we mark the beginning of a new phase - 'Smart Dubai 2021' - that revolves around challenging ourselves and surpassing our own previous achievements. We are looking to build a truly smart city, one that will use technology as the key to a balanced and happy life." 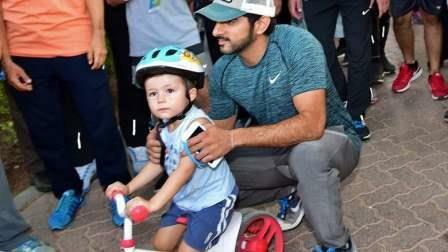 In October 2017, Sheikh Hamdan launched the incredible fitness movement that kept an entire nation on action. While inaugurating the challenge, he said: "We are keen to spread a culture of fitness since we believe that making physical activity a part of their daily routines will help people significantly improve the quality of their lives."